You'll be £19.99 closer to your next £10.00 credit when you purchase Armies of Early Colonial North America 1607–1713. What's this? 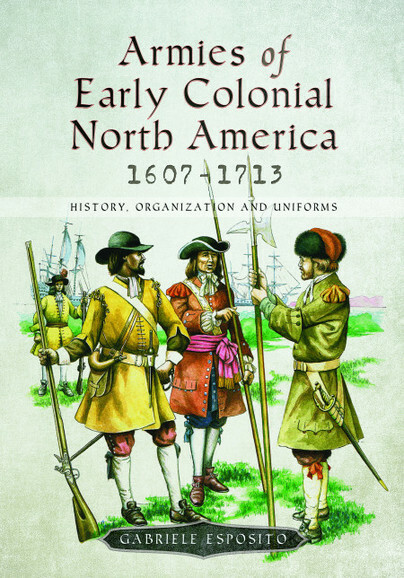 Gabriele Esposito presents a detailed overview of the military history of Colonial North America during its earliest period, from the first colonial settlement in Jamestown to the end of the first continental war fought in the Americas. He follows the development of organization and uniforms not only for the British Colonies of North America but also for the French ones of Canada. Every colonial unit formed by the Europeans in the New World, as well as the regular troops sent to America by Britain and France, is covered in detail: from the early militias of the Thirteen Colonies to the expeditionary forces formed during the War of the Spanish Succession. Great military events, like King Philip’s War or Bacon’s Rebellion, are analysed and the evolution of tactics employed in this theatre are discussed, showing how much warfare was influenced by the terrain and conditions in North America. Dozens of illustrations, including colour art works, show the first military uniforms ever worn in North America, as well as interesting details of weaponry and equipment used. This well illustrated work covers the subject matter very well and provides an insight to a little known period of North American military history. The work is of great interest and is well treated but remains a bit short uniformly speaking in relation to the visual section.